Sierra Club Florida News: 160 Florida Panthers Left and Declining! That is approximately the number of Florida panthers surviving today in the wild. 160, and declining. In 2012 alone, 14 panthers have already been killed. To stop the demise of this species, help us protect panther habitat. Although the Florida panther has been listed as an endangered species since 1967, its habitat has never been protected. Endangered species are twice as likely to resist extinction if their habitat is granted protective status. Without a safeguarded habitat, these big cats are all potential victims of traffic accidents, shootings, and intraspecies aggression over diminished breeding and foraging territory. With your help, the Sierra Club will reverse the decline of Florida’s state animal and expand its numbers. Oppose proposed urban and industrial development on primary and secondary habitat for the Florida panther. Since this partnership began, we have already filed federal lawsuits and petitions to protect the Florida panther’s habitat, but much more needs to be done. To accomplish the above, we will work with stakeholders to create consensus on where the corridors should be, strengthen our cause by working with our broad base of diverse partners, and utilize our tremendous grassroots network to educate the public. 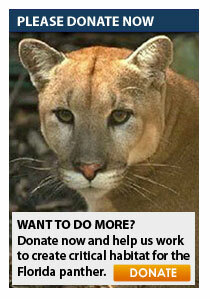 Donate now to protect Florida panther habitat and give this animal room to recover. for the latest alerts and updates.